How do I revert to an original template? Go to Settings ->Design ->Themes & Styles. At the top right of the screen, click on the "Edit Template (HTML) " button. You will see a listing of all the templates unique to your site. Look for the template that you'd like to revert and look to the far right to click on its "Action ->Edit" button. Then, click the "Original Version" link at the bottom of the page. This will reset the template to its original configuration. Connect to your store via FTP and proceed to your "/web/assets/templates/" folder. Select your theme folder and remove the template you'd like to revert. 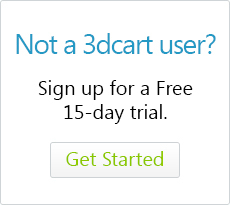 Deleting the template from the theme folder would effectively use the template from the 3dcart common folder instead and your customizations will revert. Please note however, that this method is NOT recommended for the frame.html template. If the template you're trying to revert is the frame.html, we suggest using the first option listed above. You can re-install the theme to overwrite any edits you may have made. For example, if you are currently using theme justswell-html5, and you have made an unrecoverable edit to it, go to Settings ->Design ->Themes & Styles and look for the same theme (in this case justswell-html5). Click on the theme and select its "Re-Install Theme" option. As with any case where you are reverting changes, please be sure to make back-ups of the affected files before reverting them. This way you can ensure you won't lose any work that may have been done in the past.